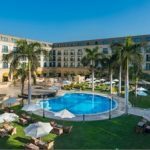 Leading five-star hotel, Concorde El Salam Hotel Cairo, has launched a series of New Year promotional packages, running throughout December (1st December 2018 to 4th January 2019),aimed specifically at residents in the GCC region. 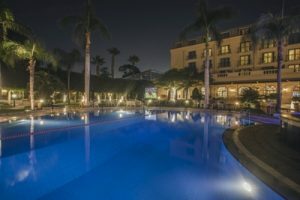 For New Year, the hotel is offering a special package for just US$280 per person which includes a New Year’s Eve party complete with dinner and live entertainment featuring superstar Hakim, singer Mahmoud El Assily, belly dancer Ala Koushner & singer Sabrine El Negaly as well as an overnight stay. The luxury Concorde El Salam Hotel Cairo, which combines traditional Georgian architectural style with contemporary elegance, boasts 323 guest rooms including suites with free WIFI Internet in all rooms and outlets. The hotel features an ‘Executive Floor’ with executive rooms and a private executive lounge which has been specially designed to meet the demands of business travellers, while leisure guests can take advantage of the hotel’s cabana pool side rooms. Food and beverage options include the signature La Veranda outdoor arena, offering a variety of Italian, Oriental, sushi, seafood dishes as well as a BBQ with live entertainment from May to November, Abou Auof Cafe serving traditional Egyptian cuisine, Italiano Italian restaurant, Le Marquis Lounge & Lobby Bar, Testa Rossa Café serving an Italian coffee blend as well as L’Auberge, Lounge Bar, offering live entertainment & serving International cuisine. The hotel offers guests a well-equipped fitness centre offering massage with Thai masseuse, an outdoor heated swimming pool, glass squash court, tennis courts, an equestrian training school and a beauty salon. The hotel also features nine large and well-equipped banquet and meeting rooms suitable for conferences and board meetings as well as for large weddings and special events. The tourism industry in Egypt recorded a strong performance in 2017, according to the Egyptian Ministry of Tourism. 600,000 visitors from Saudi Arabia and the rest of the GCC were welcomed, 25% of the total number of tourists visiting Egypt. Looking ahead, this trend is expected to continue as a series of new attractions and investments are taking place in the country. In terms of flights, it’s now easier than ever for GCC tourists to travel to Cairo as they are granted entry visa upon arrival at the airport. SAUDIA, Egypt Air and Flynas operate direct flights from Riyadh and Jeddah to Cairo International Airport; Oman Air and Egypt Air both fly direct from Oman; Kuwait Airways, Egypt Air and Jazeera operate services from Kuwait and Gulf Air flies in direct from Bahrain. From the UAE, Emirates and Egypt Air, both fly direct to Cairo from Dubai International Airport; Etihad and Egypt Air operate services from Abu Dhabi International Airport and both Air Arabia and Egypt Air fly direct from Sharjah Airport.